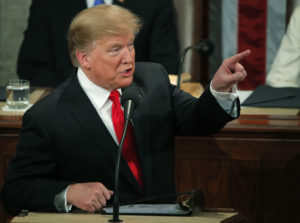 Two years into his presidency, and with the 2020 presidential election on the horizon, Trump used Tuesday’s State of the Union address to argue he’s kept his word. But the results have been uneven. Tariffs on steel and aluminum, for example, appear to have stabilized industries that were on the decline. But other import taxes on Chinese goods have cut into farmers’ bottom lines and cost American consumers in the form of higher prices. The 2017 Republican tax law temporarily boosted economic productivity and led to some additional hiring in the manufacturing and construction sectors, but tax cuts for the wealthy and corporations increased the nation’s deficit and companies said they were not necessarily investing more in workers, as Republicans had promised. Trump has staked much of his presidency on the economy, and on Tuesday, he aimed to convince Americans that the benefits of his policies far outweigh the downsides. It’s a message he is likely to repeat many times before 2020, when voters will decide whether they want to continue those policies for another four years. Here’s a closer look at the issues Trump highlighted in the State of the Union, and how they are playing out across the U.S. and global economies. The U.S. unemployment rate sits right around 4 percent, as it did for most of 2018. January marked the 100th consecutive month of jobs gains. Wages are rising. Inflation is near 2 percent, a level most economists view as ideal. Whether Trump or President Barack Obama, who was in office when the economic recovery began, should get the credit for those job gains remains up for debate. Regardless, job growth is strong, although Trump stretched the numbers in his State of the Union address. Employers have added 4.9 million jobs since Trump took office–less than the 5.3 million Trump cited in his speech. Manufacturing added about 450,000 jobs, according to the Bureau of Labor Statistics, with the mining and logging sectors experiencing particularly strong growth. Trump said Tuesday night that 600,000 manufacturing jobs had been created. He also often takes credit for the stock market, which has risen about 25 percent since he took office, though it did experience a major a downturn last December. “When things are good, politicians always take credit, and when things are bad, they try to blame their predecessor,” said Michael Farren, a research fellow at the George Mason University Mercatus Center who focuses on government and economics. The job news under Trump hasn’t been all positive, though — a reminder that presidents have limited control of the economy. General Motors announced late last year that it would lay off about 14,000 workers, with the latest round taking place Monday. The construction equipment manufacturer Caterpillar announced a series of layoffs last year, as did Carrier, the air conditioning company Trump said he convinced to reverse its plans to move production to Mexico. The last two years have been a roller coaster for workers like Tom Wolikow, who was laid off from GM’s Lordstown, Ohio, plant after working there for nine years. He recently landed a job at another GM plant in Flint, Michigan, but to get the job he had to leave his family in Ohio. Wolikow did not vote in the 2016 election but said he was excited when the president came to Youngstown, Ohio, in 2017, promising jobs would come back to the region. White House officials insist they are doing everything they can to save manufacturing jobs, pointing to Foxconn’s decision last week to go ahead with a manufacturing facility after Trump intervened. While the number of women who are working is at an historic high at about 76.6 million, the rate of women in the labor force remains at about 57 percent, below the peak of 60 percent reached in 1999. The Republican tax bill Trump signed into law in December 2017 arguably remains his biggest legislative achievement as president, although the deal only received a passing mention in the State of the Union. The tax overhaul reduced the corporate income tax rate form 35 percent to 21 percent, lowered taxes for the wealthy and some middle class families, gave tax write-offs to businesses that invested in the U.S., and doubled the standard deduction for individuals. 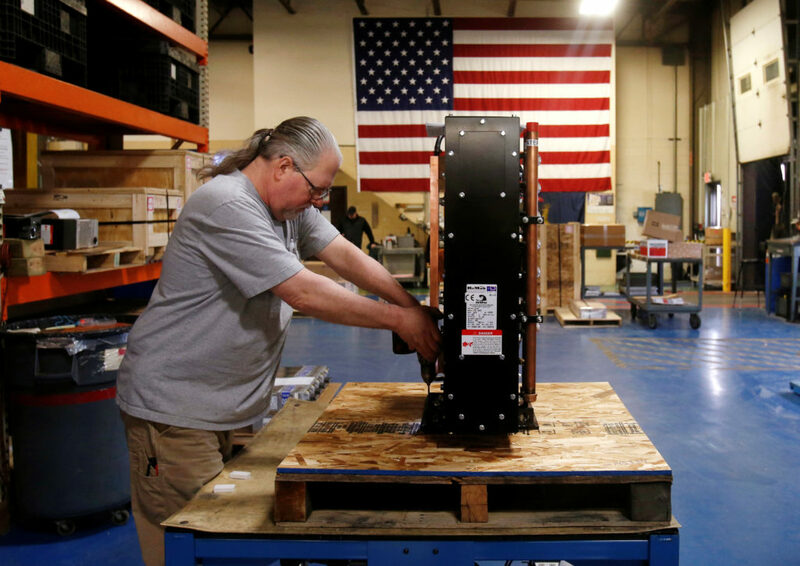 The tax cuts did boost the GDP for two quarters in 2018, but those effects are starting to wane. The construction and manufacturing industries reported in a recent survey that the tax cuts did cause them to boost hiring and investment, but more than 80 percent of all U.S. businesses said the tax overhaul did not change their hiring or investment decisions. Businesses are also increasingly worried that U.S. trade policy is dragging down the global economy. The Trump administration has also rolled back a number of Obama-era regulatory measures, another top campaign promise from Trump during the 2016 election. Those include restrictions on oil and natural gas production and power plant emissions, regulations that aimed to increase protection for employees, as well as a number of rules on smaller banks. “I think the tax cuts and the deregulation are definitely pro-growth and have helped. But we’re going to have to deal with the aftermath of that as well,” said Dan North, the chief economist at Euler Hermes North America. The “aftermath” includes a bigger deficit, and, potentially, more income inequality. “The most massive parts of the tax cut went to wealthy families, not the middle class,” said Jared Bernstein, a senior fellow at the Center on Budget and Policy Priorities who was an economic adviser to Vice President Joseph Biden in the Obama Administration. He added that the tax cuts for the middle class are set to expire in 2025, while the corporate tax cuts are permanent. The U.S. economy is expected to stay strong in the coming months, but economists are increasingly predicting a slowdown at the end of the year as the stimulus from the 2017 Republican tax cuts and increased federal spending wears off. Trump reiterated in his speech Tuesday what has become a key focus of his economic agenda: trade. “To build on our incredible economic success, one priority is paramount: reversing decades of calamitous trade policies,” Trump said. Last year, Trump implemented a host of new tariffs in an effort to gain leverage with countries he viewed as taking advantage of the U.S. China has been the main target of the import taxes, but U.S. allies, including Canada and the EU, have also been impacted. The first set of tariffs, put in place last June, was a 25 percent tax on imported steel and a 10 percent tax on imported aluminum. A report from the left-leaning Economic Policy Institute found last year that the tariffs have boosted aluminum production by about 60 percent. Mark Glyptis, the president of the United Steelworkers Union Local 2911 in Weirton, West Virginia, said the tariffs are a “welcomed relief” to an industry that has long been in decline. Before the tariffs, mills were shutting down every year across the country, but now, Glyptis said, prices are rising and the industry is stabilizing. “President Trump has given us an opportunity to bounce back,” Glyptis said. But in response to Trump’s tariffs, China imposed a 25 percent tax on U.S. soybeans, which caused a 94 percent drop in soybean exports to China. American Farmers took a major hit, prompting the Trump administration to offer them $9.6 billion in direct payments to help make up for the losses. Many farmers live in traditionally conservative states and still support the president. Yet others have grown increasingly frustrated at his suggestions that farmers should be willing to take a short-term hit for a longer-term gain. Some good news came for farmers last week when the European Union approved U.S. soybeans for use in biofuels, fulfilling a deal Trump and EU Commissioner Jean Claude Juncker made last year. Industry analysts say the move opens up a new market to U.S. suppliers, but will only lead to a modest boost for farmers overall. On the campaign trail, Trump repeatedly called out China, which is threatening to replace the U.S. as the world’s largest economy, for “unfair trade practices.” As president, he has put the U.S. relationship with China at the heart of his economic policy. He put pressure on the country in 2018 in the form of tariffs, prompting China to impose retaliatory tariffs. Tensions threatened to spiral out of control until late last year, when Trump and China’s President Xi Jinping agreed to a temporary truce. Now, Trump has set a deadline of March 1 to make a deal regarding tariffs, the forced transfer of technology from U.S. firms that operate in China to state-owned enterprises, and access to China’s consumer market. If a deal is not reached, he has threatened to imposes more tariffs on nearly all Chinese goods. Coming to an agreement will not be easy. “We are asking the Chinese to switch to a market economy that will undercut the [Communist] Party’s control,” said Bill Reinsch, an international business scholar at the Center for Strategic and International Studies. 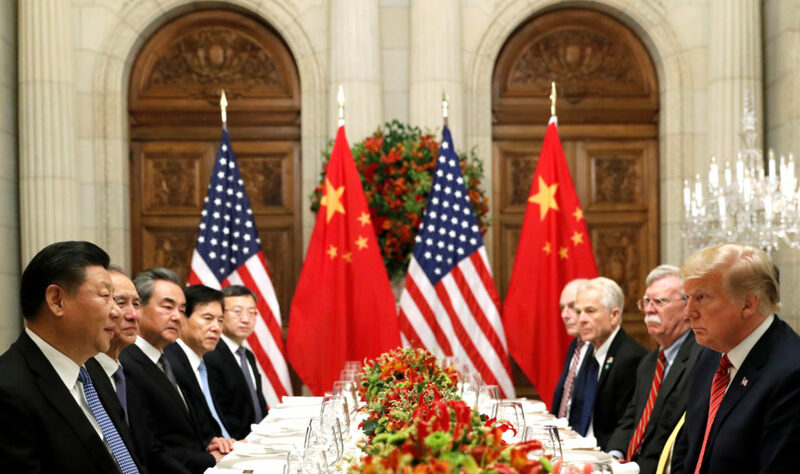 Reinsch predicted the two parties will come to some sort of smaller agreement, perhaps one that would change some of the rules U.S. companies in China have to follow. But the changes will most likely be cosmetic, he said. Trade experts say Trump’s trade dealings with China are working out better than many of them expected. U.S. consumers often pay the cost of tariffs in the form of higher prices on goods. But American companies have been able to absorb some of the cost themselves or switch to suppliers based in companies outside of China. Some companies such as Apple are expecting sales in China to drop because of the retaliatory tariffs China put on U.S. goods. But China’s economy has taken the harder hit, potentially giving the U.S. a leg up in the most recent round of negotiations. The Trump administration has “certainly been successful in creating a lot of leverage,” said Tim Keeler, a former chief of staff to the U.S. trade representative in the George W. Bush administration. The question, Keeler said, is: Are they going to spend that capital too soon by accepting a bad deal? 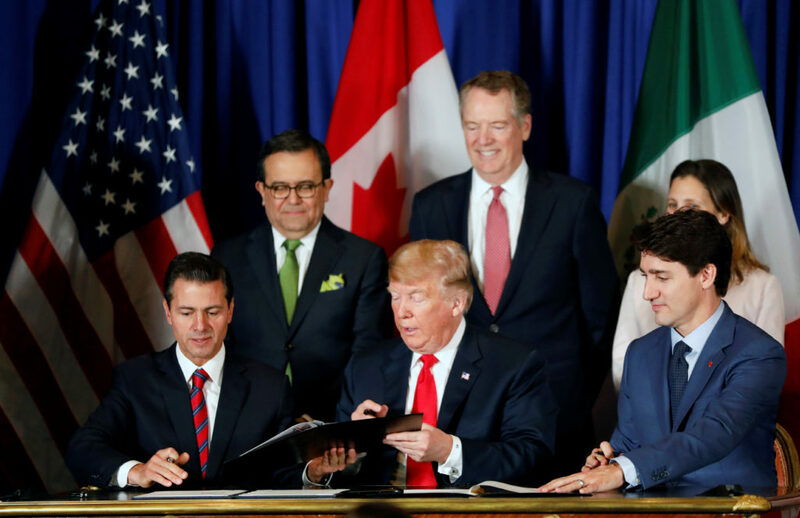 In reality, the new U.S. Mexico Canada Agreement, as it’s called, largely mirrors NAFTA–a deal Trump called an “historic trade blunder” and “catastrophe” on Tuesday–with some increased protections for workers. Some economists are also skeptical about whether the new agreement will actually lead to more cars being made in the U.S. The three countries’ leaders agreed to the deal last year, but it has to be approved legislatively before it goes into effect. In the U.S., the trade pact must be ratified by Congress, but it faces opposition from Democrats, who are pushing for more enforcement provisions to ensure Mexico complies with rules to boost pay and support organized labor. “This thing is not doomed. If you handle it right, you can get it through, but it will take some patience,” Reinsch said of Congress ratifying the deal. Trump appears increasingly impatient. Trump has previously to repeal NAFTA if the Democratic-controlled House does not approve the new trade deal. That would leave the U.S. with no agreement governing its trade with Canada and Mexico, which would cause a major disruption for businesses in all three countries. If that happens, “it’s a very big deal,” Keeler said.